Megan uses tarot cards to divine the future and a crystal cat skull's pendant (origins unknown) to focus her mystic abilities. She has access to a great deal of occult knowledge through the vast and ancient library of Castle Daemon. 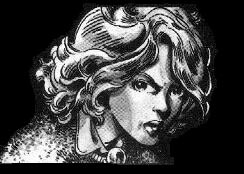 History: (Bizarre Adventures#25 - fb) - 1900 - Birth of Alisabeth Daemon on the Winter Solstice. (Bizarre Adventures#25 - fb) - c.1914? - When Alisabeth underwent her first menstrual cycle, Megan unwittingly assisted her in an evil occult ceremony. Their mother's mutilated corpse was found the next morning. (Bizarre Adventures#25 - fb) - c.1918? - When Megan underwent her own first menstrual cycle, Alisabeth made her take part in a similar evil occult ceremony. Their father's mutilated corpse was found the next morning. Alisabeth left for the European Continent soon afterwards. 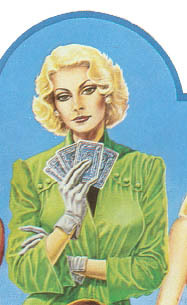 (Bizarre Adventures#25 - fb) - 1922 - Alisabeth sent Megan a deck of tarot cards as a gift. (Bizarre Adventures#25 - fb) - 1925 - As Megan turned 21, Alisabeth returned to Castle Daemon. She fought with the Clan Elders, who later mysteriously disappeared. She departed again at dawn, leaving a Writ of Abdication making Megan officially Lady Daemon. She also left Megan a crystal cat's skull pendant, which helped her progress in her knowledge of the Dark Arts and the use of her tarot cards. (Bizarre Adventures#25 - fb) - c.1930s. - Megan turned down many suitors but eventually befriended Ian MacGinnis of the Royal Scots Borderers (the circumstances of their first meeting remain unrevealed). There, Alisabeth planned to fully open the gateway which she had unlocked at Stonehenge and let the Outer Dark into our dimension, but for that, she needed her sister's power and willing cooperation -- and the slaughter of many innocent lives. However, Megan resisted and fought Alisabeth. An "Emissary" "from the Outer Dark materialized. Then, Ian MacGinnis shot Alisabeth. Megan (unlike her sister) refused to be seduced by the Outer Dark and fought them off. The battle started the fire that destroyed the Hindenburg. Megan and Ian managed to escape the disaster safely; Alisabeth's ultimate fate, however, remained uncertain. Comments: Created by Chris Claremont (writer) and Michael Golden (penciller) and Terry Austin (inker). The only tenuous connection between the story of Lady Daemon and any other known elements of the Marvel Multiverse is her description of her ancestry: "Before the MacKay, Cutherland, Sinclair, before Danes and Gaels and Picts, before the Lairds of Alban, from a time when the dark Caledonian forests covered the moors, we were!" The name Picts come from the name Pictii (painted ones), first recorded in a Latin poem c. 300 A.D., as that the Romans gave to a mysterious tribe of savage warriors (somewhat troll-like?) who lived in Caledonia / Scotland. Bede's Ecclesiastical History says they came by sea from Scythia, but does not mention tattooing or body painting. The Picts are said to have vanished c. 900 AD and from thereon moved into fiction. The Picts are of course part of the Robert E. Howard canon, especially the Bran Mak Morn series. Howard likely learned of the Picts through Sir Walter Scott who (wrongly) believed that the galleries in the walls of the Brochs were low and narrow because of the Picts' small stature. (In fact these prehistoric stone towers pre-date the Picts). Robert Louis Stevenson's ballad "Heather Ale" and John Buchan's story "No-Man's Land", both written in this century, portray the Picts as diminutive and living underground. In Howard's canon, the Picts are connected with Brule (from the King Kull stories), Conan ("Beyond The Black River", "The Black Stranger" and "Wolves Beyond The Border"), Cormac Mac Art (two hundred years after Bran Mak Morn's time) and arguably Turlogh O'Brien (a few small bands unabsorbed by the conquering Scots in the tenth century survived into the early twelfth century). Their ultimate fate is displayed in Howard's "The Little People". Are the Picts mentioned by Megan Daemon the same Picts as encountered in Howard's fiction, and therefore the Marvel Universe? Possibly. As to the "Outer Dark", they are reminiscent, of course, of HP Lovecraft's Great Old Ones or Elder Gods, or the N'Garai or the Undying Ones, but they are never identified. However, this provides another loose connection to the Marvel Universe, as Kthara, Mother of Demons is known as "She who Rules the Outer Dark." Same writer (Claremont), same name. Coincidence? So ultimately, the question of whether Lady Daemon's adventures took place on Earth-616 or another Earth remains ultimately unanswered. Exactly...nothing to rule them out...a few possiblities to rule them in. Several characters from Marvel Preview (which became Bizarre Adventures) and other such stories have eventually been confirmed as Earth-616, most notably--to me--Star Lord. Anyway, all it takes is an oblique reference to rule her in. I'll try to find--or make--one! There is a Loch Daemon in the highlands of Scotland in Excalibur I#1-2 that is described as "a haunted place where from time immemorial, it's been said that even angels fear to tread." It's the location for the derelict factory where we first see Widget and the young Colin McKay. There is a stone circle near the factory that Colin describes as an ancient Druid ring. There is a flashback to the scenes in the factory in Excalibur I#46 when Colin returns as Kylun. I don't remember any other appearances of the loch, though it is mentioned in Kylun's OHOTMU profile. Obviously Chris Claremont isn't above reusing names, but perhaps there is a connection to the Clan Daemon? "The Eyes That Never Close!" Strange Tales I#61 (February, 1958) -- a magic idol transports prisoner Jeff Corley to the LZ-129 Hindenburg. Lady Daemon could be a face in the crowd. 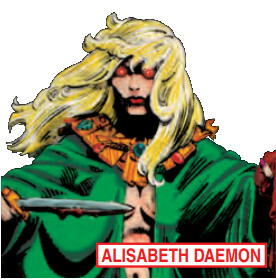 Lady Daemon has a full entry in Marvel Legacy: The 1980s Handbook. Powers/Abilities: Magical powers (full extent unrevealed). History: Alisabeth Daemon is the evil sister of Megan Daemon (Lady Daemon). She was responsible for the death of her parents. Her primary goal appears to be the opening of a gateway between the dimension of the Outer Dark and ours, and she later became possessed by the Outer Dark. Her history is intertwined with that of her sister. Powers/Abilities: Reasonably competent fighter, proficient with firearms. History: Ian MacGinnis is Megan Daemon (Lady Daemon)'s suitor. He helped her defeat her evil sister Alisabeth aboard the Hindenburg, although his shots may have unwittingly triggered the tragedy. His history is intertwined with that of Megan. History: Nothing is known about the Outer Dark, summoned by Alisabeth Daemon. They are reminiscent of HP Lovecraft's Great Old Ones or Elder Gods, or the N'Garai or the Undying Ones, but they are never identified. 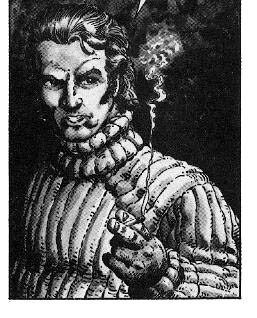 They managed to willingly possess Alisabeth Daemon and dispatched a monstrous "Emissary" aboard the Hindebnurg. They tried to enlist Megan Daemon's help, but failed. All other characters mentioned or pictured are tm and © 1941-2099 Marvel Characters, Inc. All Rights Reserved. If you like this stuff, you should check out the real thing!